Sunday April 7 1907 It rained most of the forenoon. Will went over to John Cray's for a horse be bought. Billy to town all day. I was busy with the work all afternoon. I took of more chickens Ida Vaughn was here afternoon. I read a little after supper and went to bed early. Monday April 8 1907 Will went back to Cedar Rapids this morning. It was a very cold ugly day. Billy was plowing the meadow. I had a letter from Lizzie Lindley and she will not come to Iowa City now. I put in some time ripping up an old dress to fix over. Will did not get home tonight. Billie had to go to town after supper. [text in right margin illegible] Tuesday April 9 1907 Will went back again this morning. Weather cold. I was taking care of my chickens in the house. I have more than 80 hatched out and set some more hens tonight. Billy cutting stalks. I finished ripping up my dress. Will home at 5.30. He was in the jury room all night. 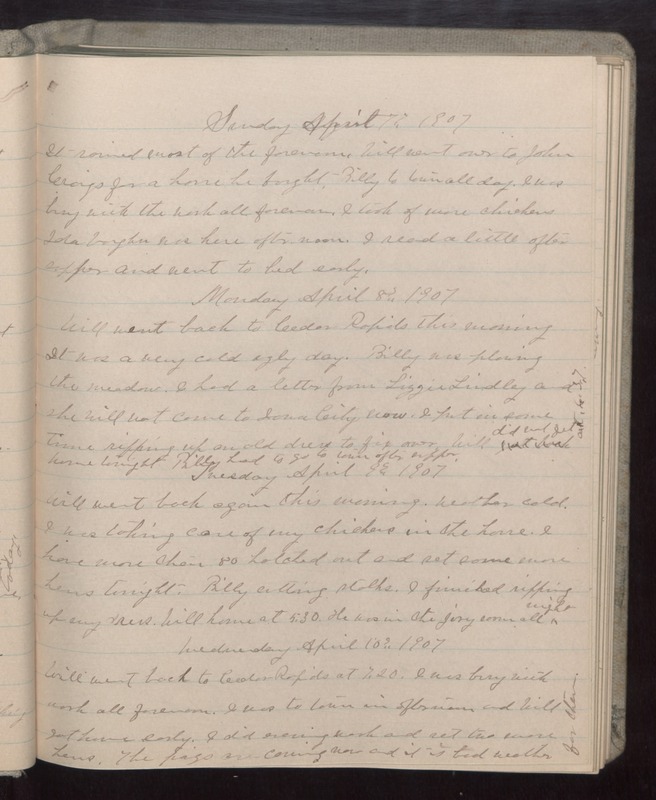 Wednesday April 10 1907 Will went back to Cedar Rapids at 7.20. I was busy with work all forenoon. I was to town in afternoon and Will got home early. I did evening work and set two more hens. The pigs are coming now and it is bad weather for them.